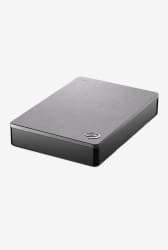 Seagate Backup Plus Slim portable drive STDR4000301 is a smart choice to opt for and stay connected with the digital world to keep a backup of the data. It has a memory storage capacity of 4 TB. Moreover, it is also easy to carry due to its slick and ergonomic design. Install the free Seagate Mobile Backup app on an iOS or Android mobile device to back up all of the pictures and videos from the device to your external drive or the cloud.